(CNN) -- Evander Holyfield failed in his bid to become the oldest heavyweight champion when he lost on points to giant Russian Nikolai Valuev in Zurich, Switzerland on Saturday. Holyfield struggles to escape the reach of seven-foot Russian world champion Valuez in Zurich. One judge scored the bout a draw while the others had Valuev winning 115-114 and 116-112 thus denying 46-year-old Holyfield the heavyweight title for the fifth time. American Holyfield will take time to consider whether to return to the ring after his defeat. "I will go home and think about the future," he said. "But I knew I could still do it. "I fought very well and won the fight but I did not get the decision. I think I showed tonight that I still can box and that age does not matter." Valuev said it was an honor to fight a legend like Holyfield. "I am proud to have been in the same ring with him," he said. "He was very fast and hard to hit. I can only advise people not to get hit by him. I expected a tough fight and that is what it was. Holyfield is a great fighter and he proved it tonight." With Valuev controlling the centre of the ring in the opening rounds, Holyfield danced around his opponent, hitting with occasional single shots. He did well to stay away from Valuev´s long left jab and hit him with a big left in the fourth, but the Russian answered with a strong right uppercut. Much to the delight of the crowd, the fifth was a good round for Holyfield who first landed a right-left combination to the body and later connected with a big left hook to the head. 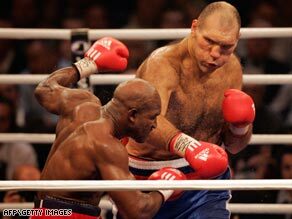 Both men were on target during a mid-round exchange in the sixth, but Valuev´s left jab looked more effective. In the seventh, the crowd raised the roof when Holyfield fired in a combination to the head. Valuev´s corner urged him to be more aggressive and he eventually landed a strong right in the eighth when Holyfield seemed to tire a little. The seven foot Russian remained on the front foot as there was a big exchange during the ninth, and in the 10th Holyfield landed a strong right-left combination. Valuev finished better and pushed his opponent in the corner in the 12th . After the final bell, both men hugged each other, with either fighter claiming the win. When the scorecards were read, boos rang out as the crowd favorite's narrow defeat was confirmed.